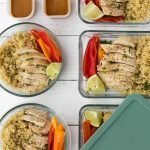 Have your meal prep complete in under 30 minutes with these Thai Peanut Chicken Meal Prep Bowls. The thai peanut sauce brings a harmonious flavor to the dish without adding any processed ingredients. Quick, easy, gluten and dairy free. Add ins could include: edamame, cabbage, shredded carrots. Cut up bell peppers into thin slices and arrange on top of chicken breasts in a casserole dish. Drizzle with cooking oil over peppers and chicken. Cover with foil and bake for 15 minutes. Remove foil and place back in oven for 3-5 more minutes depending on thickness of chicken breasts. While the chicken and peppers are cooking, make the thai peanut sauce by combining all ingredients in a bowl and whisking together. Arrange 5 meal prep containers, scoop out 1/2 cup quinoa into each container and 3-4 ounces of chicken. Depending on sizes of chicken, you might have some leftover for another serving. Evenly disperse peppers into each container making them even. Sauce can be poured in meal prep bowls before or placed in a separate container and poured in at mealtime.